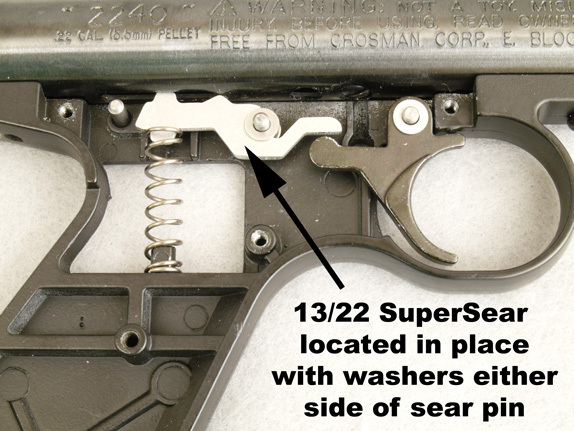 Archer on Airguns: The 13/22 SuperSear is Back! After a short pause in availability, the 13/22 SuperSear is back and just as good as ever! 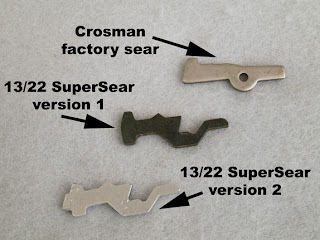 The 13/22 SuperSear is a drop-in replacement for the standard factory sear used in Crosman 1377, 1322 and 2240 pistols - together with their many variants. In Archer Airguns testing, it gives a significant reduction in trigger pull weight of about 2lbs: that's a 40% improvement compared to the factory sear. Of course, this sear is another product of the noted airgun upgrade designer Steve_in_NC. This new "Version 2" of the SuperSear features the same geometry as the earlier version, only the method of manufacturing is changed - NOT the performance. The body of the sear is now CNC-sculpted from aircraft-quality Aluminum, with alloy-steel, load-bearing, wear-resistant, precision-machined pins at the bearing points. 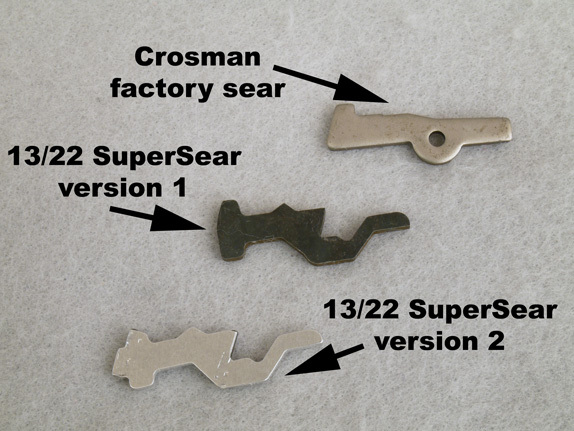 Please note that there will be compression marks on the surface of the sear, this is an artifact of the manufacturing process and has no effect on the geometry or performance of the 13/22 SuperSear. Installed mine recently, works awesome.